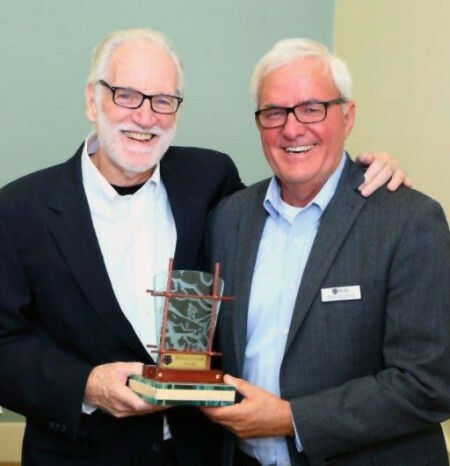 Stanley Keasling presented John Mealey with the William French Award in November to recognize his lifetime achievements of leadership in rural development, building and sustaining an organization that benefits rural communities and has a regional impact. If there is one thing John Mealey would tell younger people who want to work in the helping and housing fields, it is to keep their real boss—the people they serve—in mind. A simple principle, the proverbial keeping his nose to the grindstone, has guided Mealey for nearly four decades to provide homes for low-wage earners in the Eastern Coachella Valley. During the years, his fundraising and vision have helped bring an impressive $750 million toward constructing more than 4,500 homes for farmworkers, restaurant staff and hotel employees. For his invaluable work and impressive accomplishments, Rural Community Assistance Corporation (RCAC) honored Mealey this year with the William French Award. The award is given to individuals who demonstrate the lifetime achievements of leadership in rural development, building and sustaining an organization that benefits rural communities and has a regional impact. Mealey has a unique perspective on how the self-help housing industry has changed, what has gotten easier, what problems remain entrenched but not insurmountable, and how best to approach and solve those problems. In 1982 as Coachella Valley Housing Coalition’s (CVHC) first employee, Mealey started with a $10,000 seed money grant from the Aetna Foundation. Today, CVHC is the largest developer of low-income housing in Riverside County and one of the largest residential developers of any kind in the Coachella Valley. There are fewer hurdles now to overcome. When CVHC first began building homes, it came up against a tide of challenges, he says, including convincing the U.S. Department of Agriculture (USDA) in some instances that the work was even necessary. Labor contractors, not growers, provided some cardboard homes. Other families lived in small trailers with barely enough room on the floors for the children to sleep. CVHC borrowed from the state of California to buy land for the first farmworker housing but it took about four years to obtain the necessary USDA loan and grant to build. CVHC’s congressional representative marched into USDA’s headquarters in Washington D.C. to lobby for the project. A farmworker and CVHC board member went into the fields and got more than 800 workers with families to sign applications for the apartments when and if they got built. This convinced USDA that there was a need for decent homes for very low-income workers. In the meantime, another board member, who was a real estate broker, found the ideal site for farmworker apartments and donated his commission to CVHC. Also, the architect and engineer waited years to get paid. “We tried to create places for these families that were comfortable, bigger and better,” he says. That apartment complex represents one of Mealey’s proudest moments, he says, as it was the first of its kind for farmworkers in the entire Coachella Valley. It housed 50 families, was clean, decent and affordable and it ultimately set the stage for expanding CVHC’s work beyond farmworkers to low-earning restaurant and hotel employees, and more recently homeless veterans and retired farmworkers. The organization, under Mealey’s leadership, has received wide recognition and awards, including the Hope Award from the National Association of Realtors, an Energy Star Award for Excellence in Affordable Housing from the U.S. Environmental Protection Agency, and a Fannie May Maxwell Award of Excellence. Mealey was also a founding member of Rural LISC and a Bank of America Advisory Board member. He is a board member for the California Coalition for Rural Housing, the National Rural Housing Coalition and the National Equity Fund. Under his leadership, CVHC has also developed home ownership opportunities for low-income families, mostly using the USDA Mutual Self-Help Housing Program. The organization has organized more than 1,200 families to work in groups of eight to 10, to construct their own homes in Coachella, Indio, Blythe, North Shore, Mecca, Palm Springs, Cathedral City, Palm Desert, Desert Hot Springs, Brawley, Salton City and La Quinta. In addition, CVHC has 50 contractor-built homes and 90 “rehabilitated” homes. Mealey has been the force behind all of these accomplishments, but he is quick to give credit where credit is due. He studied at Temple University and also at Villanova University School of Commerce and Finance before starting his career as the director of real estate operations at a large Philadelphia nonprofit housing organization. He also worked with the County of Riverside Department of Housing and Community Development (now the Economic Development Agency) for several years before he started CVHC.